Grand Hyatt Berlin is centrally situated near the Potsdamer Platz. This design hotel has an artful ambience, modern guestrooms, international kitchen and great meeting areas. 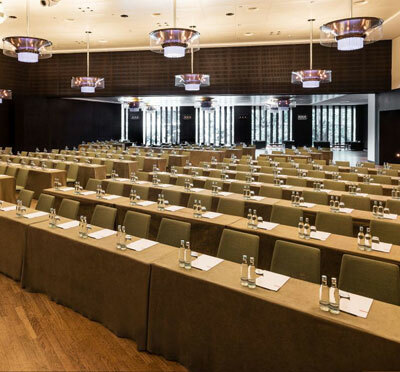 Grand Hyatt Berlin has 326 elegant rooms and 16 luxurious suites, offering at the same time 9 meeting rooms with a capacity between 8 to 850 guests. All to welcome smaller and larger business groups, seminar guests, private or corporate parties, exhibitions, product launching and other kind of events. The hotel has two restaurants, Vox Restaurant and Tizian Lounge. Vox Restaurant’s food is influenced from the international kitchen using regional and seasonal products. In the menu you can find all from delicious spaghetti to authentic sushi. At Tizian Lounge Restaurant you find a variety of international dishes. Take a drink and enjoy the moment with colleagues and friends at the Vox Bar or Jamboree Bar. Experience Club Olympus Spa & Fitness’ wellness oasis of 800 sqm. Besides relaxation, you can enjoy breathtaking views from the top of the building. Here you find a whirlpool, indoor pool, steam bath, sauna, solarium and a large outdoor terrace.